Like and Dislike functionality in lots of apps today is useful functionality for rating images and profiles like are found in apps like Tinder. It is pretty simply to implement functionality like this using Delphi XE8 Firemonkey. I had a developer in Eastern Europe build this example app for Firemonkey via UpWork. You should be able to compile and use this app on Android, IOS, OSX, and Windows. The app is called FMXExpress Tinder and it takes an RSS feed and downloads all the images from the feed via TNetHTTPClient. It then loads the images into a TTMSFMXBitmapContainer and the rest of the RSS data into a TFDMemTable. You are presented an image which you can swipe to the left to Dislike the image or swipe to the right to Like the image. You can also double click or tap the image to load the URL from that RSS record in the external browser of the device. There are two rectangles stacked on top of each other. When you swipe the top rectangle left or right you can see the next image in the stack in the second rectangle below the first. Once the top rectangle completely swipes away then it resets to it’s original position with the image from the second rectangle in it. The second rectangle gets the next image in the set loaded into it and this system repeats with each swipe. Full source code for this example is provided. It should also work in Appmethod. 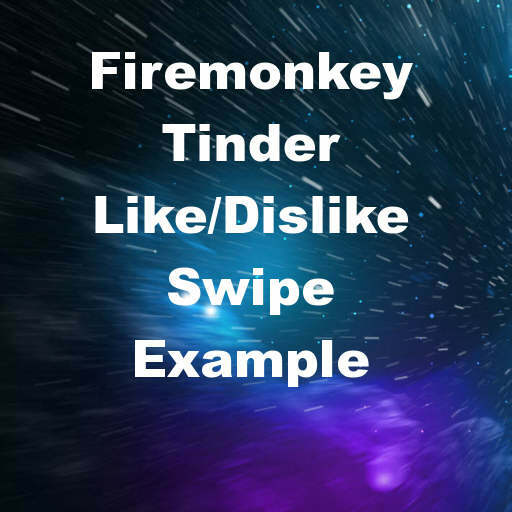 Download the Tinder like Like Dislike swipe example for Delphi XE8 Firemonkey.